We were at an orthopedic medical facility for an appointment. While we were walking down the long hallway to the department we were headed to, a boy, around six years of age was turning in circles not paying any attention to what he was doing. I was about to say something when his dad yelled at him to watch what he was doing. Further down the hall, a boy of about eight years was doing the monkey walk, where you walk an imaginary line, putting the heel of one foot against the toe of another. He was looking at the floor and didn’t see us coming. We moved out of his way as his dad, who was walking ahead of him, looked over his shoulder to see where his son was and yelled at him to get out of the way. At what point parents, do you stop running interference for your children and begin training them? We would say both of these situations are an excellent life opportunity to train a child in the way he is to go (Proverbs 22:6). All too often, we are so focused on other things or pressing matters of the moment so we don’t take the time to teach into our children’s life moments. I heard the father saying as we walked slowly past the eight year old, “What are you thinking? Why aren’t you watching where you are going? Can’t you see this isn’t the place to be goofing around? ” His son was not even looking at him, much less paying attention to anything he was saying. In other words the boy received a lecture and went on with life, not thinking he needed to change a thing. Yes, he stopped the monkey walk for a few minutes, but would he go back to it again? Since there had been no training and no correction, we were sure he would. In reality, these children were trained. They were trained to do whatever they wanted to do for as long as they wanted to do it until someone in authority intervened. What does biblical training look like? Training needs to start at home with teaching. ‘On-the-spot’ training is rarely successful. For the above situation, use a family night to role play situations your children encounter that they need to be especially watchful of where they are going. Teach your kids that they always need to be looking where they are going. Teach them what types of people they need to look out for. Tell them to move closer to the wall or shelves in stores to give these people more room. Always tell them to be listening for additional instructions from you whenever you are out with people. Use a pre-activity warning before you go. A pre-activity warning is the use of questions to ask your kids before you get somewhere. When our kids were growing up we used pre-activity warnings on our way to church, the store, the park and anywhere else we went. Pre-activity warnings are not times for lectures. You are getting them to remember the rules for themselves, not lecturing them before they have gotten into trouble. Ask questions. “We are going to the hospital to see Grandma. Since Gram is so sick she has to be in the hospital so they can take care of her, how do you think you should act in her room? If you are unsure, what can you do? (Ask Mom) When we are at the store or at church, what type of people do you look for in the hallways that you need to be extra-careful around? Do you think you would know by looking if someone was sick? (No) So how do you think you should walk in the halls here? (They might say be extra-careful or hold your hand) See how this works? A pre-activity warning is a tool to support your training efforts. Before you can use it your kids need to know what your expectations are first and they need to be characterized by obedience. 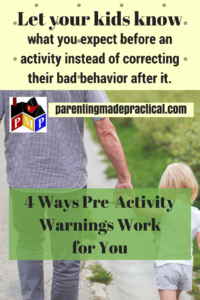 Pre-activity warnings work for young children too. When our young grandchildren are visiting (4 yr.s & 6 yrs.) before we leave the house to go to the park nearby we ask them what the “Park Rules” are. They will tell us they must hold our hands until we tell them they can run and play. If they are riding their bikes they will tell us they must stay on the sidewalk where we can see them and they can’t cross a street without our permission. Keep your rules simple. Pre-activity warnings eliminate chaos wherever you go. Instead of correction and consequences your kids get the blessing of praise and encouragement because when they know what to do, they usually will do it. Please don’t ever think you don’t have the time to work issues through with your kids.